This organization specializes in Mennonite Church and family history in Juniata County, but also includes local, non-Mennonite and other areas of interest. In 1977, years of research and writing came to fruition with the publishing of Noah Zimmerman and Spencer Kraybill’s History of a John Graybill Family in America, 1754-1976. The volume, over 700 pages, is known as a defining scholarly work on the history of the village of Richfield and the Graybill family who first settled in the Richfield area in the 1770’s. Kraybill and Zimmerman painted a picture of this small town in central Pennsylvania from its beginnings until the time of the writing of the book. 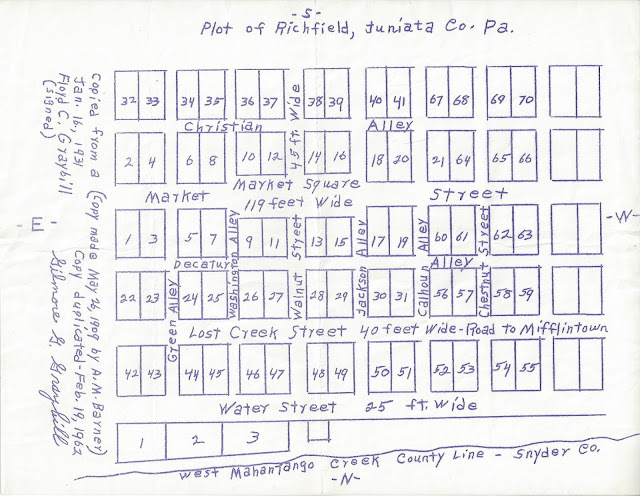 They gathered primary source documents, records compiled by other historians and geneologists to trace branches of the Graybill family who moved away from the Richfield area, background information on the Anabaptist persecution in Europe which resulted in a wave of Anabaptist immigration to “Penn’s Woods,” and a brief history of the Juniata Valley prior to settlement by European peoples. Personal stories and pictures of many of the Graybill descendants are added, bringing the names and places to life for the reader. Even more impressive is that this book was done long before internet was available for public use, and all the research was conducted by collecting information in person or by correspondence. The Anabaptist faith brought persecution from the Swiss government, due to several controversial teachings of the Anabaptist faith. The Anabaptists faced opposition for their unwillingness to baptize infants, and to swear oaths in court, but most of all for their doctrine of nonresistance and its followers’ refusal to bear arms against their fellow man. The Swiss republic had been maintained by hard-fought battles against neighboring monarchies. The Swiss government feared that if the Anabaptist faith were to become common, large numbers of its citizens would refuse military service, and the Swiss republic would be in danger from larger, stronger kingdoms around them. By the 1680’s, Anabaptists were so severely persecuted in Switzerland that a group of about 700 left Switzerland and emigrated to Germany about 1681. Among them were Peter Krehbiel and his family. The Krehbiel family lived in Weierhof, in the Palatinate in Germany for several generations. It is likely that Johannes Krohbiel, who would later emigrate with his family to Pennsylvania, was a grandson of Peter Krohbiel, although records that would prove that definitively have not been found. But in Germany, the Mennonites again faced persecution because of the doctrine of nonresistance, which was at odds with the mandatory military service which was required of young men in Germany in the mid-1700’s. Across the Atlantic Ocean, William Penn’s newly founded colony of Pennsylvania was a refuge for many who were persecuted for their religious beliefs. The colony was founded on, and governed by, Quaker principles, which were in sympathy with the Mennonites’ doctrine of nonresistance. Johannes (John) Krehbiel, his wife Elizabeth, and their children John, Elizabeth, Barbara, and Maria emigrated to Pennsylvania in the early 1750‘s. On June 14, 1753, John Krehbiel, Sr. applied for a land patent in Manheim Township, Lancaster County, Pennsylvania. In 1766, after the death of the elder John Krohbiel, this land was passed to his son, John Krehbiel, Jr. The younger John Krehbiel was born 8-18-1735, in Weierhof, Germany. He would have been a teenager when he emigrated to Pennsylvania with his parents and siblings. He married Barbara Daradinger, b. 5-9-1737. In the 1770’s, much of Pennsylvania was still wild frontier. The land was heavily wooded and game was plentiful. Travel was via waterways, on foot, or by horseback. Roads were few; most were paths or Indian trails. Wild animals were a danger to man and beast, and Indian attacks on frontier settlers were not uncommon. Huge stands of virgin timber had to be cleared for building and farming. Tools and implements for felling trees, working the soil, and building barns and dwellings, were primitive. It was a land rich in resources, but to settle on Pennsylvania’s western frontier was not for the faint of heart. This was the place to which the Krehbiel family came. World events indicated turbulent times. The American colonies were on the cusp of revolution, and would soon declare their independence from the British crown. The Krehbiel family was somewhat geographically isolated from the events taking place to the east of them--a Declaration of Independence, and a Revolutionary War which was to decide the future of the nation. The revolution created a crisis of conscience for the nonresistant folk who believed in paying taxes--”Render unto Caesar that which is Caesar’s...”--but could not, in good conscience, go to war. The Mennonite objection was both to war itself, and also to the rebellion against the King of England, whose authority they viewed as given by God Almighty. The Mennonites could not give their support for war, or for rebellion against the British throne. On the land which John Graybill purchased stood a solidly built stone structure, built over a spring. Oral tradition and maps of the time show a fort on the Mahantango Creek, called Pomfret Castle, which had been built for frontier defense around the time of the French and Indian War. Pomfret Castle is believed to have stood on what was to become the Graybill homestead. The question of the existence of Pomfret Castle has been the subject of much debate by historians. The author will explore this debate in a future post, as it seems to deserve its own chapter of this story, rather than being an afterthought of the story of the John Graybill family. John and Barbara Krehbiel moved into this stone structure in 1774, and made it a dwelling. They raised a family of nine children, all of whom lived to adulthood--truly remarkable in this time and place where infant and maternal mortality was high, illness and accident befell many, and medical care (especially on the frontier) was scarce and primitive. Their children, in order of age, were: Christian, Anna, Jacob, Mary, John, Barbara, Susannah, Magdalena, and Catherine. Christian, the oldest child of John and Barbara Krehbiel, was born 1-9-1756. He married Maria Shellenberger (b.8-19-1762) and to this union were born seven children: Barbara, Sarah, Magdalena, Anna, Christian Jr., Jacob, and Peter. Christian Krabiel, Sr., is listed in the will of his father John Krabiel (note change in spelling) dated 2-25-1806 as receiving 100 acres of land. 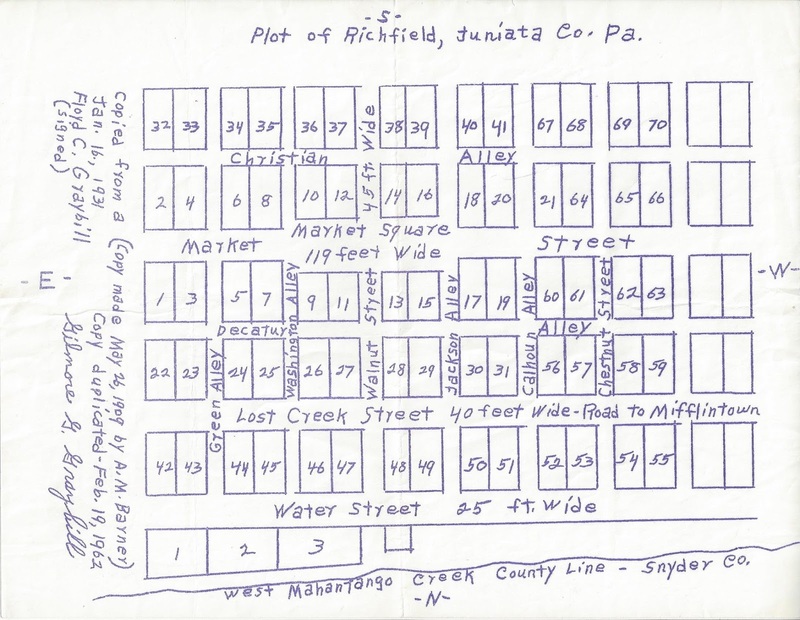 Twelve years later, in 1818, Christian laid out the village of Richfield. 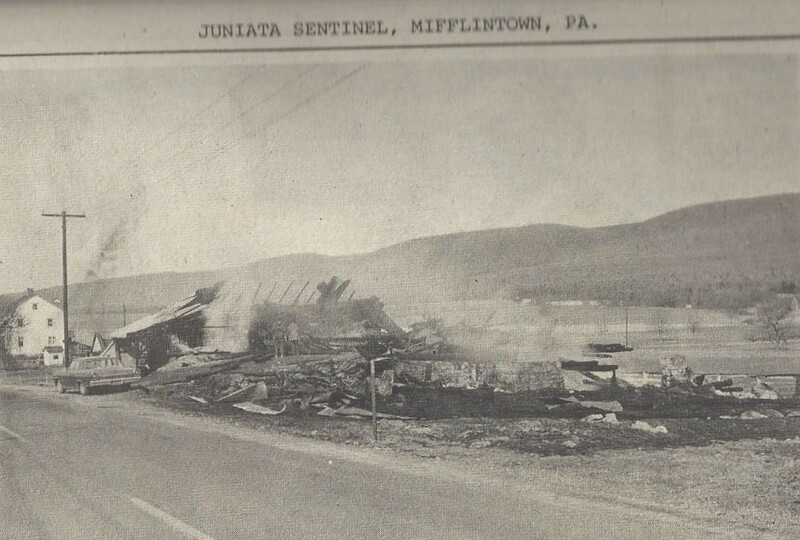 The original portion of the town consisted of 4 streets running parallel to each other and to the Mahantango Creek--the northernmost street being Water St., 25 ft wide, running along the Mahantango Creek; Lost Creek St., 40 ft wide, labeled “Road to Mifflintown,” present-day State Route 35; Market Square, present day Market St., and the southernmost street being Christian Alley. The streets were connected by (west-east): Green Alley, Ridge or Walnut St., Calhoun Alley, and Chestnut St.
Christian Sr. died 12-29-1825, at the age of 69. Anna, the second child of John and Barbara Krehbiel, (no birthdate given in the Graybill book) married Jacob Acker 5-25-1784. 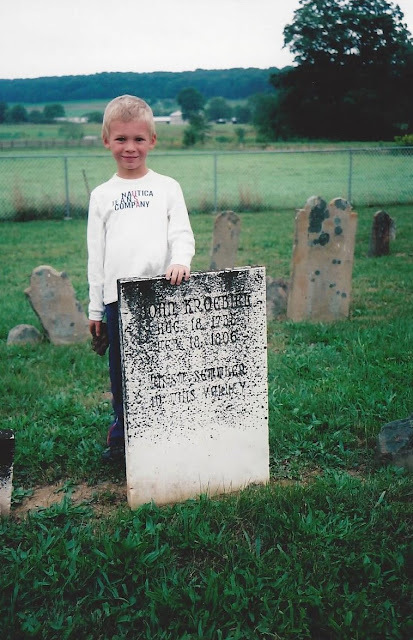 Jacob was a son of Peter Acker from Lancaster County. Jacob died 4-12-1813; no death date is given for Anna. Their children were: Anna, Henry, Jacob, Abraham, Christian, Barbara, Peter, Emmanuel, Elizabeth, and Alice. Jacob, the third child, was born 6-9-1761, d. 4-20-1829. He married Magdalena Schneider, b. 3-8-1759, d. 1-8-1826. Their oldest son, Christian, later became known as Preacher Christian Graybill. Also born to Jacob and Magdalena were Jacob Jr., Peter, Thomas, Herman, Hannah, and John. The fourth child in the family was named Mary. She married a man named William Knepp, or Knepley. No further records were available on this family at the time of the writing of the Graybill book. John Krehbiel III was born 4-20-1766. His first wife was Christina Burge. She was born in February 1766 and died in January 1794 at the age of 28. John’s second wife was Mary Eppler, b. 5-2-1772, d. 4-6-1853. John was ordained a minister in the Mennonite church in 1788, at the age of 22 years. He also became a bishop, possibly at or around the time of his ordination. The Graybill book notes that he was the first bishop of the Mennonite churches in Juniata and Snyder counties. The children of John Graybill and Christina Burge Graybill were: John Graybill IV and Elizabeth. The children of John Graybill and second wife Mary Eppler Graybill were: Christian, Catherine, Anna & Mary (twins), Barbara, Frances, Jacob, Hannah, Susanne, and Abraham. Translation- I Barbara Krebielin was born in the year of Christ, 1802 on 28 May. at the Cross Roads Mennonite Cemetery in Snyder, County, Pennsylvania. Note: "Krebielin" is the feminine form of the surname "Krebiel"
Barbara was the sixth child of John and Barbara Krehbiel. She married William Zimmerman, who died in 1802. Barbara then married Andrew Sheaffer. Her children were: George Zimmerman, Joseph Zimmerman, Christian Zimmerman, Martha Sheaffer, Susannah Sheaffer, and Hannah Sheaffer. Magdalena was the eighth Krehbiel child. She married Herman Snyder Jr. (Schneider). Their children were Jacob, Cathy, Magdalena, Frances, Elizabeth, John, Hannah, Anna, Sarah, Barbara, and Maria. The youngest of the Krehbiel children was Catherine. No birthdate is given for her, but records show that she married Peter Sechrist. To this union were born: John, Christian, Peter Jr., Henry, Jacob, Michael, Martha, and Daniel. Catherine died 1-19-1848; Peter died 3-13-1842. Some of the descendants of John and Barbara Krehbiel carried the pioneer spirit of their parents and grandparents westward from Pennsylvania. Graybill families were among the pioneers who went west to Kansas, Iowa, and other parts of the United States in the 1800‘s. Where listed, occupations of Graybill descendants and their spouses include blacksmiths, dentists, doctors, lawyers, farmers, mechanics, truck drivers, realtors, pastors, historians, teachers, homemakers, construction workers, and many more. Some have stayed with the traditional Mennonite faith of their forefathers; others have embraced different denominations. Many pastors, deacons, Sunday School teachers and various church workers are represented in the pages of the Graybill book. Some have stayed with the doctrine of nonresistence taught by their Mennonite ancestors, some have served in the military by draft or by choice. If the Graybill descendents were to be catalogued today, the book would be much more extensive than the original work. A later work would almost certainly include a greater variety of locales and life experiences than Kraybill and Zimmerman recorded in 1977. The influence that these Pennsylvania Mennonite pioneers, John and Barbara Krehbiel, had on the generations that followed after has reached across boundaries of geography and culture. It is a heritage to be treasured. in the old Cross Roads Mennonite cemetery, Richfield, Snyder County, Pennsylvania. A few miles west of Richfield, just east of the village of Evendale on the Snyder/Juniata county line, lies a farm that was once known as the Watering Trough Farm. In the days of horse-drawn travel, a spring just south of what is now State Route 35 filled a trough which travelers used to water their horses when passing through. In the late 1700's, the spring was owned by George MccTeear and was part of the notably crooked county line between what was then Cumberland and Northumberland counties, now Juniata and Snyder counties. The crooked county line is explained in Volume II of the Snyder County Historical Society's History of Snyder County. 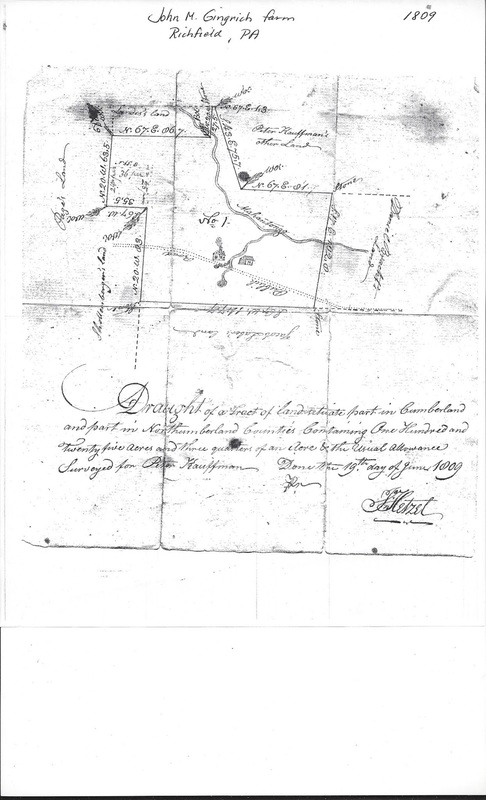 A June 19, 1809 surveyor's document showing the Watering Trough farm, stating that it was surveyed for Peter Kauffman (Kauffman is shown on the document to have also owned the land bordering the farm to the northeast) shows a 125 and three-quarter acre tract of land, part in Cumberland and part in Northumberland counties, with a house and barn. The house is on the west side and the barn on the east side of a stream or creek of some size, originating from what appears to be a spring in the field south of the “Publick Road” running just south of the house, and a smaller branch from the aforementioned “watering trough” spring. This places the house in what is now Snyder County, while the barn is across the county line in Juniata. The farm came into the Gingrich family through the Sellers and Knouse families. In the latter part of the 1800's, it was owned by Jerome Winey and his wife Susan (Sellers) Winey. The Wineys had no children, and upon her death, Susan's will bequeathed her possessions, including the farm, to her sister Amanda Sellers Knouse. 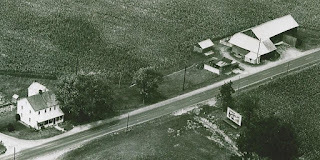 After Amanda's death, her son-in-law and grandson, John W. Gingrich and J. Lloyd Gingrich, acquired the farm from her estate in 1952. Father and son had formed a business partnership; both lived on the Gingrich farm in the village of Evendale, several miles west of the Watering Trough Farm. In the spring of 1974, the old log barn shown in the 1809 surveyor's report caught fire on a windy day in March. Glenn Graybill (a friend and neighbor of Lloyd Gingrich) was traveling on Middle Road just north of the farm when he saw the smoke. He was able to get to the barn in time to let the cattle out so that none were lost. Neighbors took the cattle to Merrill Hoffman's barn, located on Middle Road, north of the Watering Trough farm. Richfield firefighter Sam Graybill Jr. remembered the day well. The Richfield fire company had recently purchased a new 1973 fire engine and equipment which Sam described as the “beginning of the modern era of firefighting in Richfield.” The new engine had a 1000 gallon water capacity which was double the capacity of the company's 1954 engine. But on that windy day in March, the 1973 engine was at Regesters being serviced and Richfield was only able to respond with the 1954 truck which held 500 gallons of water. Richfield was assisted by mutual aid from McAlisterville and Fremont fire companies, who each responded with trucks with a 500 gallon capacity. The wind blew the fire across route 35 and set the field to the southeast of the barn on fire. Fortunately, the firefighters were able to put the field fire out before the fire spread significantly. But with the tremendous heat of the fire, limited equipment, and high winds, the firefighters could do little more than stand back and watch the barn burn, and keep the fire from spreading. The old log barn burned to the ground. The fire burned so hot that an entire aluminum elevator was never accounted for in the wreckage afterward. The electrical wires above the barn, running parallel to Route 35, were melted, causing a power outage for hours and posing further danger to the firefighters and other first responders. The old log barn was replaced by a new barn, completed before the year was out. Lloyd's son and daughter-in-law John M. and Rosanne Gingrich moved to the property in 1979 to raise their young family. A 62,000 layer hen house was built in the field to the northwest of the house, completed in the fall of 1979. The farm became known as the Gingrich Egg Farm. Neighbor Brent Snyder remembers riding his bike from Richfield to the farm to work in the chicken house when he was a teenager. The old Watering Trough farm has kept pace with the times, but reminders of long-ago are never far away. An addition was added to the old farmhouse in the 1990's, but the brick fireplace in the center of the kitchen, original to the house, has been beautifully restored. The old wash house still stands out back, now used as a garden shed. John and Rosanne's children and their cousins have fond memories of playing in the water of the old spring, under the tall trees that grew around it, although the watering trough of bygone days has crumbled with the passing of time. The children of the 1980's are grown, and now grandchildren come to visit, the next generation to play in the spring and climb the apple trees. Among the older folks of Richfield, if you know whom to ask, there are still a few who remember the days when the old watering trough still offered a drink for the weary traveler. Welcome to our introductory page! This is the beginning of our 40th year of service to the community! Our organization may be small in comparison, but we have a large collection of valuable information that includes a library, artifacts, Family Bibles and more. We hope to utilize this site as a window into our collection. 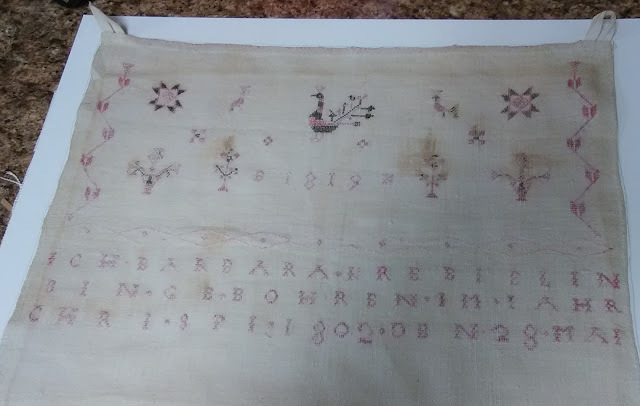 There will be future posts related to an artifact or family Bible in our collection. We are open to the public at 37322 Rt. 35S, Richfield, PA, 17086. Hours: Tuesday - 9 a.m.-4 p.m. 7p.m.-9p.m. and Saturday 9 a.m.-4p.m. The public is welcome to access information in our library and archives during hours of operation. Members have access to the lending library. But we do not conduct a mailing service for volumes in the lending library. The quarterly newsletter, Echoes is available for a $25 annual membership. Keep looking for exciting posts at this location within the next few months.